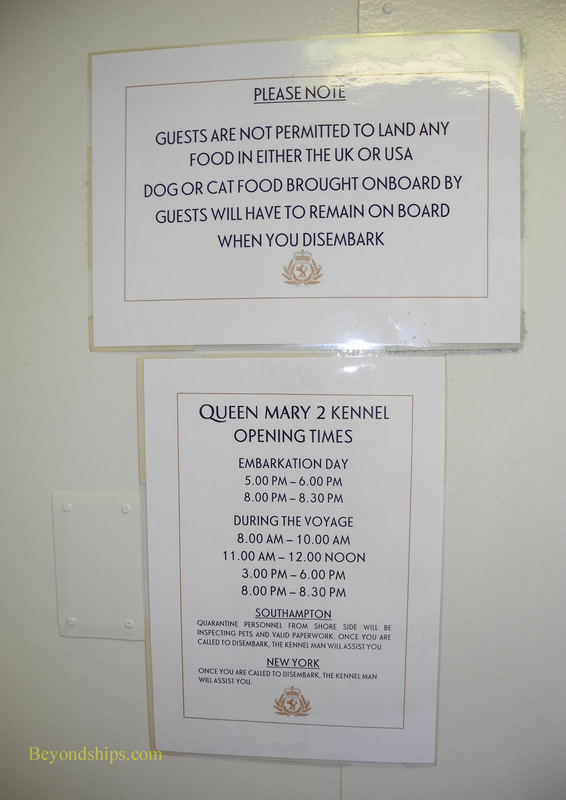 One of the unique things about Queen Mary 2 is that she offers passage for pets. The ship not only has a dedicated section for its four-legged travelers but also a trained crew member in charge of these guests. We spoke with Kennel Master Jojo Bulabon about this unusual program. The animal area is located high on the ship on the starboard side of Deck 12 and includes outdoor as well as indoor facilities. The outdoor area is a stretch of open deck where the animals can run, play and take care of business. It is fenced off so that uninvited two-legged passengers do not intrude upon the animals' privacy. Indoors, the area includes two large rooms. One is a playroom in which the furry ones can frolic and/or spend time with their “parents.” The other room is the sleeping accommodations - - 12 kennels arrayed in two tiers. As a general rule on passenger ships, the higher your cabin is on the ship, the higher the price. However, here the lower row of kennels commands a higher fare than the upper row. They are somewhat larger and do not require the passenger to be lifted in and out. The dividers between one kennel and its neighboring kennel can be removed so as to create more spacious accommodations. Thus, 12 is the maximum number of animals who can travel on a given voyage. Often because guests have taken more than one kennel for their pets, there are fewer animals. Of course, an owner seeking to give the pet more room must pay for the second kennel. Passage is restricted to dogs and cats. While most are small to medium-size breeds, large dogs such as German shapards and golden retrievers have been accommodated. ﻿Above: The outdoor section of the kennels area. Consideration has also been given to what will happen to the pets in case of emergency. Each owner is given written instructions on the procedures to follow under such circumstances. There are even special animal life jackets. There is considerable demand for the transatlantic crossings. Guests seeking to bring a cat or dog aboard typically have to book a year in advance and there is often a waiting list. Nonetheless, some animals are experienced cruisers. One cat has done 12 transatlantic crossings. “That Jack Russell over there has nine crossings.” Mr. Bulabon pointed to a small dog who was gathered with several of his fellow travelers.